Unitarian Universalist Congregation is committed to welcoming and affirming people of all abilities. 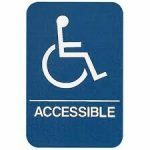 Our parking lot provides many spaces close to the building reserved for those with handicap parking passes, and our entryway at the rear of the building is wheelchair-accessible for those using wheelchairs and walkers or otherwise unable to walk up stairs. One restroom on the upper level and two on the lower level are handicap-accessible also. These are also all-gender. For those with hearing impairments, we provide assisted listening devices in our sanctuary that work with our sound system in the sanctuary and fellowship hall.